Wikileaks published 20,000 leaked DNC e-mail messages, many of which proved controversial for the purportedly neutral committee. News leaks web site Wikileaks published a massive cache of 20,000 Democratic National Committee (DNC) e-mails on 22 July 2016, just days before the start of the Democratic National Convention. Interested parties immediately began sorting through the mountain of communications between DNC staffers and contacts such as news media personnel and lawmakers. In the first few hours after the dump occurred, several documents were flagged as particularly noteworthy, primarily because the DNC outwardly maintained they favored neither of the leading Democratic candidates (i.e., Hillary Clinton and Bernie Sanders) and had attended to both equally. Hi all — We are starting to plan ahead with messaging to our supporters for the end of the primary and transition to the general. 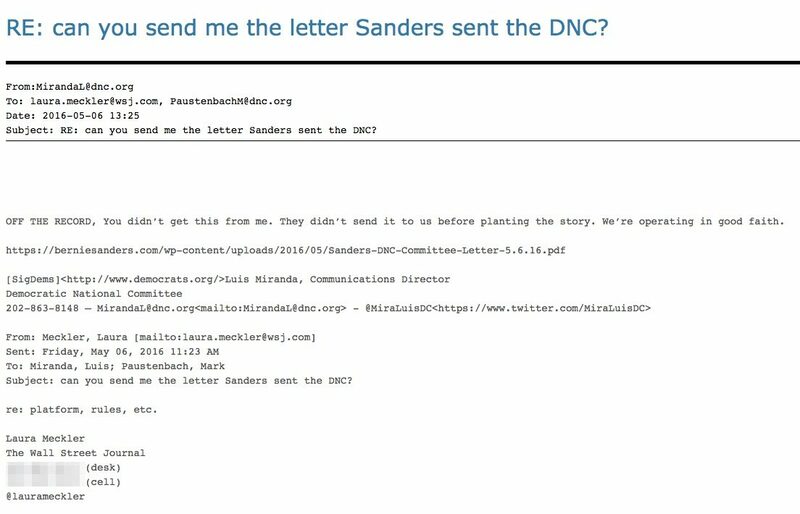 Despite the DNC’s repeated discussion of Clinton’s presumptive win, a 6 May 2016 DNC e-mail labeled media allegations that the committee was planning on a Clinton nomination as “#bernieclickbait.” In another message, DNC operatives discussed a Politico item about Clinton that was provided to the DNC for review before publication. That e-mail included National Press Secretary and Deputy Communications Director Mark Paustenbach, whose fingerprints appeared on more than a few of the controversial communications. Specifically, DWS had to call Bernie directly in order to get the campaign to do things because they’d either ignored or forgotten to something critical. She had to call Bernie after the data breach to make his staff to respond to our concerns. Even then they didn’t get back to us, which is why we had to shut off their access in order to get them to finally let us know exactly how they snooped around HFA’s data. Same was true with the standing committee appointments. They never got back to us with their names (HFA and even O’Malley got there’s in six weeks earlier) for the committees. So, again, the chair had to call Bernie personally for his staff to finally get us critical information. So, they gave us an awful list just a few days before we had to make the announcements. True, but the Chair has been advised to not engage. So we’ll have to leave it alone. Among items Wikileaks highlighted in their tweets were dozens of e-mails marked “on deep background.” Neither the DNC nor Wasserman Schultz has yet addressed the contents of the leaked e-mails. A searchable archive of the leaked messages is hosted here.